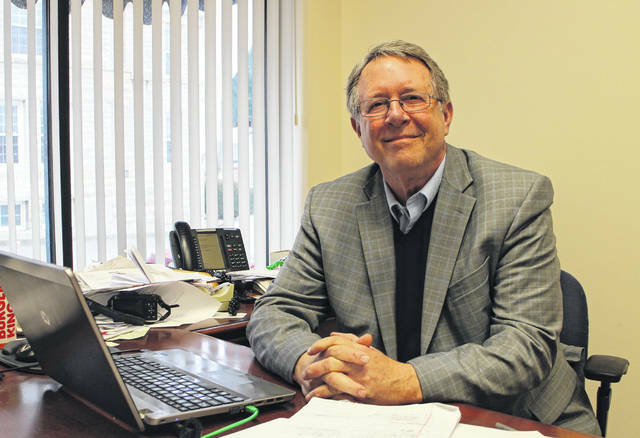 Gary Abernathy, current Times-Gazette publisher and editor-in-chief, is shown in his office earlier this year. Gary Abernathy, publisher and editor of The Times-Gazette, was appointed Monday to serve on the Highland County Board of Commissioners for the remainder of the year, replacing former commissioner Shane Wilkin, who was recently sworn in as representative of Ohio’s 91st House District. In two separate votes late Monday, the Highland County Republican Central Committee appointed Abernathy to the commission and also voted to nominate him as the party’s candidate in the November General Election. Abernathy was one of eight candidates who applied for the role after Wilkin resigned last month. The process for the appointment was prescribed by a directive from the Ohio secretary of state, according to Paulette Donley, executive chairwoman of the Highland County Republican Party. While Donley is often the spokesperson for local Republicans, she is not a voting member of the central committee. According to Donley, all 31 central committee members heard from applicants individually in executive session and asked followup questions. Following discussion, the meeting was opened to the public and the committee held one round of balloting. Donley said once a candidate had received a majority vote of 16, the counting was stopped. Abernathy received the majority vote. Central Committee Chairman Dean Otworth said Tuesday afternoon that paperwork certifying Abernathy as a commissioner had been approved in Columbus earlier in the day. Abernathy was set to be sworn in Thursday morning by Wilkin at the commissioners’ weekly meeting, postponed one day due to the Fourth of July holiday, Otworth said. Abernathy said establishing effective communication with the public will be one of his top priorities in office. Otworth said the central committee had its choice of “very good candidates,” and thanked them for applying for the position. According to Otworth, the applicants were Abernathy, Scott Bates, Rick Kisling, John Gillespie, Amy Davis-Fulkerson, Russell Newman Jr., Destiny Bryson, and Steve Roush. Donley commended the applicants for their desire to serve Highland County. The Highland County Democratic Party will appoint a candidate to be on the November ballot. Independent candidates had 10 days to file following Wilkin’s resignation. According to the Highland County Board of Elections, no independents filed. Abernathy will resign from the newspaper effective Friday, July 13.